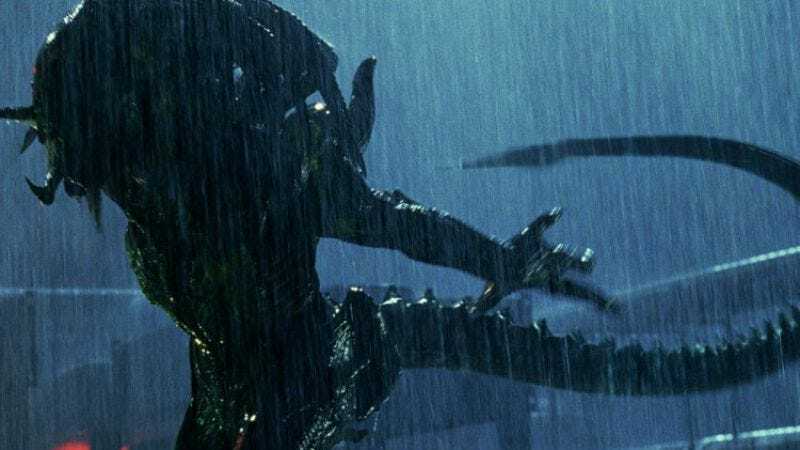 As the comic-book marriage of two floundering action/sci-fi/horror franchises, the Aliens Vs. Predator movies were bound to be a whole more awkward than the sum of their parts. The not-insubstantial trick of it would be to acknowledge the Frankenmovie goofiness of the premise while still managing some thrills and scares along the way. The first AVP movie, from Resident Evil maestro Paul W.S. Anderson, at least satisfied one side of the equation, embracing a supremely dorky mythology involving expository hieroglyphs, a pyramid system buried 2,000 feet below the Antarctic surface, and predators hunting aliens for sport. The sequel, AVP: Requiem, is somehow a significant drop-off in quality—a tasteless, witless, mindlessly perfunctory bloodbath that has the discourtesy to take itself seriously. Pitting aliens against predators may be the height of frivolity, but God forbid anyone have fun with it. Picking off where the last one left off—what, don't you remember?—AVP: Requiem starts on a predator ship heading off into space after wrapping up that whole Antarctica situation. Trouble is, one of their fallen comrades has become host to an alien parasite, resulting in a predator-alien hybrid (a pralien? an alidator?) that forces the ship to crash land in small-town Colorado. After a hunter and his son are impregnated in short order, a city full of America's blandest stereotypes comes under siege, leaving beleaguered sheriff John Ortiz to fight off the invasion while waiting for the National Guard. Meanwhile, another predator arrives to wipe out the alien infestation, though it's not terribly concerned if humans wind up as collateral damage. The keys to the AVP kingdom have been handed over to "The Brothers Strause," Greg and Colin, a pair of visual effects artists who have music-video experience (Nickelback, Disturbed, and Staind are among their dubious clientele), but haven't learned how to turn shots into sequences. Screenwriter Shane Salerno, who's credited with Armageddon and the Shaft remake, provides the D-list cast with stock subplots (a pizza delivery boy trying to impress a hot girl, an Army mother home from active duty, a juvenile troublemaker made good) and dialogue that begs for some levity. Together, the filmmakers excel only at providing memorably repugnant imagery, including a small boy who watches his father's chest get ripped apart seconds before his own and aliens run riot in a maternity ward full of newborns and expectant mothers. The door is left open for another sequel; if someone would kindly shut it and board it up, that would be much appreciated.